According to new study, researchers have discovered a rare skeleton of a new species of plant-eating dinosaur in Utah's red rocks that lived 185 million years ago and may have been buried alive by a collapsing sand dune. The discovery confirms the widespread success of sauropodomorph dinosaurs during the Early Jurassic Period. The new dinosaur species is named Seitaad ruessi, which is derived from the Navajo word, "Seit'aad," a sand-desert monster from the Navajo creation legend that swallowed its victims in sand dunes; and Ruess, after the artist, poet, naturalist and explorer Everett Ruess who mysteriously disappeared in the red rock country of southern Utah in 1934 at age 20, Sify reported. Joe Pachak was hiking in the Comb Ridge area near Bluff, Utah, when he spotted the bony fossil protruding from the multicolored cliffs of the Navajo Sandstone, which represents the remains of a huge sand dune desert as large as the modern-day Sahara Desert. As such, the dinosaur has been named Seitaad ruessi, derived from the Navajo word "Seit'aad," a sand-desert monster from the Navajo creation legend, FOXNews reports. According to The Star, named Seitaad ruessi, the species was 3 to 4.5m long and 0.91 to 1.2m high. 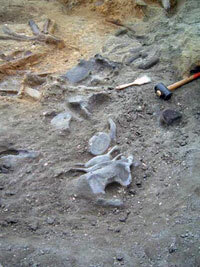 Its bones were found below an ancient Anasazi cliff dwelling. The word Seit'aad means a sand monster that buried its victims in dunes in Navajo legend, according to the researchers.